Actual image does not contain an apple and is correctly classified as not an apple. Suppose we use a model that is able to detect apples in an image. We test the model on 100000 images out of which 1000 have apples, and 99000 have no apples. After testing we get the following confusion matrix. 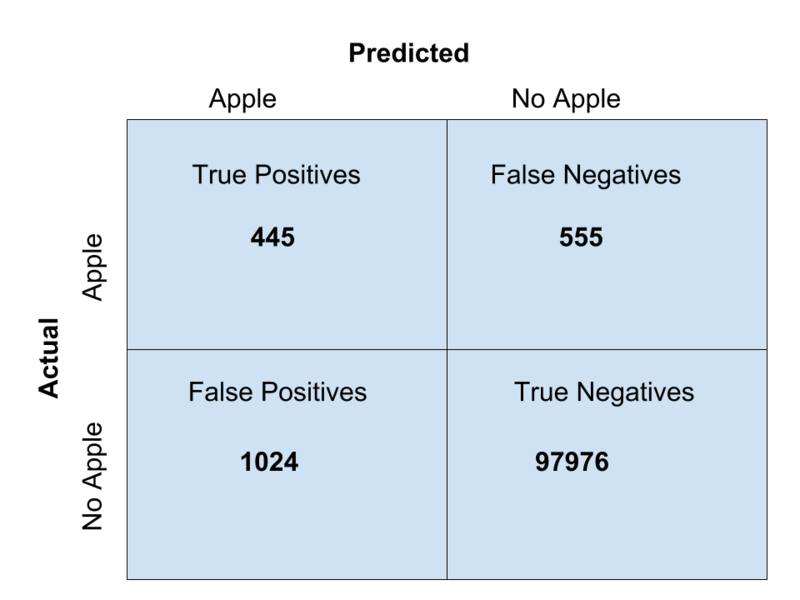 Although accuracy can be an useful tool to test any model, it can fail when the data is skewed, especially in classification models. In such a case, having a higher accuracy does not guarantee that the classifier is doing well, just that it is good in justifying the skewed data. In the case of detecting apples, if the number of times an apple is presented to the model is low, the chances of the model to detect it as an apple also increases, and hence the accuracy. But in this case we don’t know whether our model will do well when it is presented with an image that is not an apple. We will never come to know even if the accuracy is above 98%. Accuracy Paradox: Predictive models with a given level of accuracy may have greater predictive power than models with higher accuracy. These disadvantages may turn out to be catastrophic if we are using Accuracy to calculate correctness of a model in cases of fraud detection, cancer detection, etc. We might want to detect cases where a tumour is classified into benign. Just imagine a model predicting that a person does not have a disease even when the person has the disease. Accuracy score ignores such cases, and we might not be able to test how good a model is to detect tumors or any other diseases. In such a scenario, F1 score comes for our rescue. To calculate F1 score we need to calculate Precision and Rescue. Precision (P): Of all the images classified as an apple, what fraction actually have apple. That means how many positive predictions were correct. P = TP / (TP + FP). Here you can see that the Precision has severely dropped because of the skewed data. Recall (R): Of all the images that have apple, what fraction were correctly classified as apple. Now both Precision and Recall are important measures. F1 score helps us in finding a value that incorporates both Precision and Recall. F1 score is the weighted average of Precision and Recall. Thus F1 score captures the balance between Precision and Recall and a good F1 score can justify the strength of a model in classifying data. If there is any imbalance in Precision and Recall, or both Precision and Recall are low, the F1 score will penalize the classifier. The above F1 score shows that the model has failed miserably, which the accuracy score was not able to identify. Hope you are able to use F1 score in your classification project. The higher the better. If you have any queries, please mention them in comments.